For the first time that I can recall these weren't first posted to Newsarama. Maybe whatever exclusive they had was up? Even lighter load of books than last month. Glad to see Tomas Giorello back on X-O Manowar! Super light, and not a lot of new stuff. They have really changed Faith into a character that has very little excitement for me. I'm not super jazzed about the Bloodshot reboot either. Love that Shadowman continues. When does "The Life and Death of Toyo Harada" come out? Wasn't there meant to be a new #1 each month of 2019? I had hoped by this point we'd have a higher volume of comics being published, then again, Valiant still had some light months before DMG took over. My LCS came through with an ashcan! Holy s*** Tomas Giorello is back on X-O! Yes! Covers are all around sick as in January. -Oh my god that Massafera PRS cover is fire. -Special props to Michael Manomivibul's beautiful and evocative C cover. Seriously, if you haven't seen it and you happen to be reading this, do yourself a favor and check it out. Still no Nadler/Thompson on Bloodshot. Very confused and disappointed in this whole situation. Only five books again. I could have sworn DMG promised to have a new #1 every single month in 2019. I think they stated there would be 12 #1 issues in 2019, not one per month. In some other thread I crunched the number 1 issues from previous years which on average had 14 to 16 #1 issues. That includes one-shots, annuals, etc. Awesome! Man, I am so looking forward to that series. I had thought it was coming in January as well. 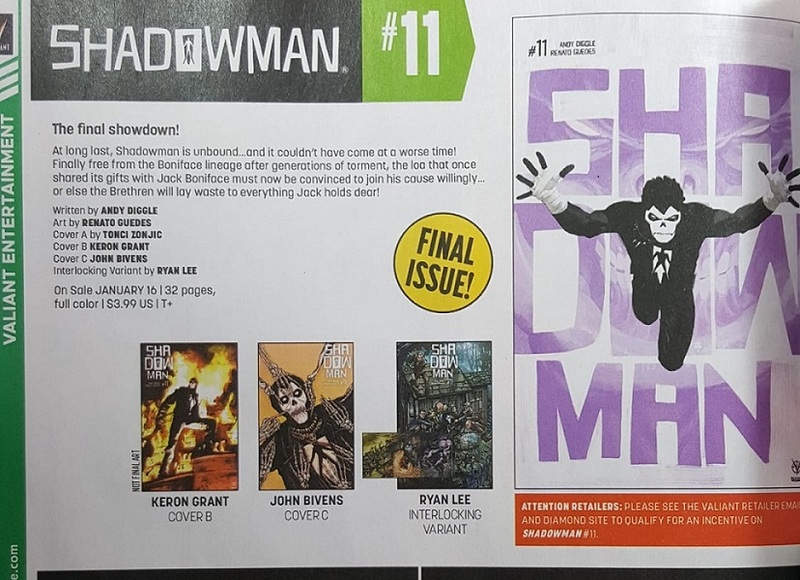 The only one I’m honestly looking forward to out those 5 is Shadowman. I will be giving the Bloodshot & Livewire books a try, hopefully they’re good and I will stick with them. Zero interest in Faith and now XO too - I really strongly dislike what Kindt has done to all of Aric’s supporting cast. I'm also looking forward to seeing what the new BS and Livewire comics are like. Shadowman's been awesome to date, and despite a lot of contrary views on the board I've been loving Kindt's run on XO too. I really don't get what all the fuss is about with that comic, I've really enjoyed it I've only read Dreamside #1 to date, and that was a super slow starter, so I don't really have an opinion on the rest of the series yet. Love the meme, hate another series biting the dust super early. I mean, from a TPB standpoint, I’m surprised they didn’t go to 12. Well I suppose it's great to know they have such a massive sales staff to sell, sell sell people on buying this handful of books.